The bubble, in fact, doesn’t always appear when someone is typing, or disappear when someone stops typing. 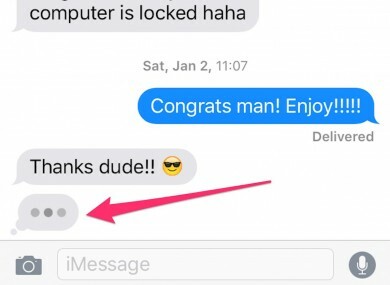 IF YOU USE Apple’s iMessage, then you know about the ”typing awareness indicator” — the three dots that appear on your screen to show you when someone on the other end of your text is typing. For example, the bubble doesn’t show up if you haven’t texted with the person who’s texting you for awhile. This makes sense, of course, because you’re unlikely to be looking at the text message thread of someone who hasn’t texted you in a long time. And the indicator don’t always disappear when someone stops typing. Last year, Slate did a series of tests to find out exactly how the dots work. It turns out that if you start typing something, but stop before sending the text (and don’t delete what you’ve entered), the bubbles remain. The other person may think you’re typing, but you could have just entered some text and then decided not to send it. The indicator only disappears 60 seconds after you started the text. We tested this out — even if you stop typing, quit iMessage, or lock your phone, the dots keep dancing on the other person’s screen. If you go back to that text and start typing, the bubbles won’t appear on the other screen. Be sure to watch the full video from Slate to see how the typing indicator works on Facebook and Gchat. Email “Those dots you see in iMessage are more complicated than you think”. Feedback on “Those dots you see in iMessage are more complicated than you think”.